NEW BRITAIN - With just over five minutes remaining in the second half of Saturday’s game against Bryant, CCSU men’s basketball head coach Donyell Marshall knew his leading scorer needed a breather. Tyler Kohl, ranked fourth in the NEC in scoring, needed a mental rest rather than a physical one. The same energy he had remained from the opening tip, but after picking up his fourth foul, Kohl was clearly frustrated. So Marshall took his leading scorer out as the Blue Devils were in the midst of a colossal comeback against the Bulldogs. Kohl was back in the game minutes later looking like a new player. The senior showed a calm poise on multiple drives to the basket, remaining in control and drawing three fouls that led to five points from the free throw line. 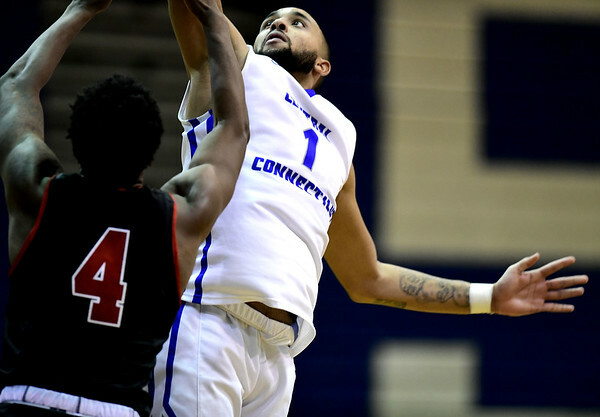 When the final buzzer sounded, CCSU had turned a 13-point, second-half deficit into a five-point win, with Kohl recording six of the final eight points for the Blue Devils (10-13, 4-6 Northeast Conference). Saturday’s thrilling comeback once again highlighted the offensive potency of Kohl, and his ability to take over a game as long as his head is in that game. During the past two games, both CCSU wins, Kohl has conquered his frustrations and turned in 52 combined points. Less than two weeks before the Blue Devils’ current streak, Kohl scored 11 points over a two-game span, and was benched for the majority of the second half while the Blue Devils were trying for another second-half comeback against Robert Morris. Marshall wouldn’t reveal the reasoning behind leaving Kohl on the bench back on Jan. 21, but he has never shied away from offering the truth surrounding Kohl’s game: when he shuts the noise out around him, he shines the brightest. Saturday afternoon served as a perfect example, as Marshall pulled Kohl to help him calm down, knowing he was worth more to him relaxed for five minutes of game clock than on edge for eight. For a player like Kohl, who thrives with the ball in his hand and driving to the basket, whistles and foul calls become more likely, and while Kohl doesn’t always agree, it won’t change his style of play. Marshall realizes that Kohl does have a case sometimes when questioning certain calls, but regardless of the outcome, he knows Kohl is worth more to him with a level head. There have been times when frustration has taken Kohl out of a game, but with a timely breather like on Saturday afternoon, Kohl regained his focus and led the Blue Devils to one of their most thrilling wins of the season. Even Kohl pointed to the brief benching as a turning point in the game, in what was one of Marshall’s best decisions of the contest. Kohl knows Marshall and the coaching staff need him back on the court just as much as Kohl needs the staff to help him hit the reset button. Posted in New Britain Herald, CCSU on Sunday, 3 February 2019 21:42. Updated: Sunday, 3 February 2019 21:45.